One of the highlights of any holiday family reunion is the time spent enjoying a delicious meal together. Moose Hollow Lodge has a beautiful kitchen that is fully equipped with all the amenities necessary for efficient meal preparation. Whether you want to bake a ham, roast a turkey or make your favorite holiday treats, our full kitchens make cooking and cleaning a breeze! The only thing that you should bring is any groceries and supplies you might need, as well as your appetite! 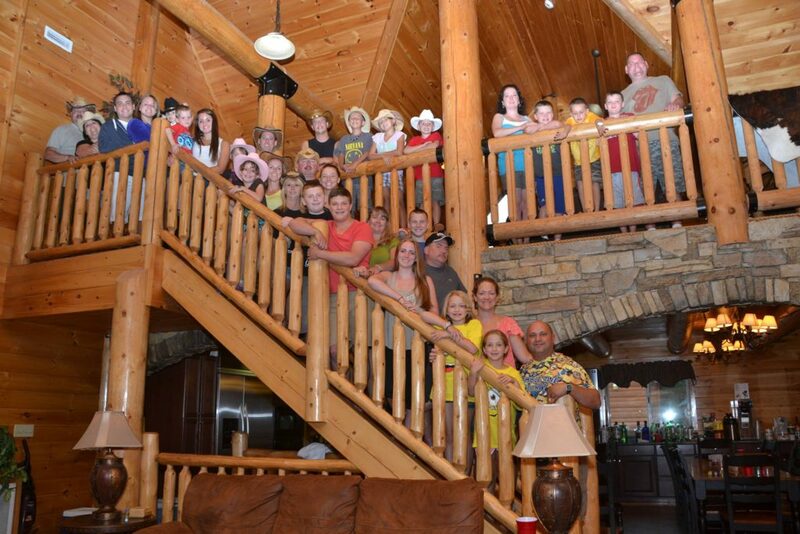 Your family will love our fantastic location that is surrounded by the beauty of the Great Smoky Mountains! Although the air outside may be chilly, you can warm up with your family members in one of our two large outdoor hot tubs. There is nothing like kicking back in the bubbling waters of the hot tub as snowflakes gently fall from the sky. Moose Hollow Lodge is situated in a stunning location, we are still just minutes from Gatlinburg and Pigeon Forge. As a result, you can enjoy wonderful seasonal events and special holiday shows! When you have so much family in one place, it can be difficult to keep everyone entertained. While this is especially true if you happen to have younger children, you can leave those worries at home. 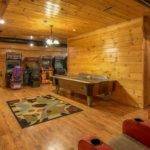 Our large Pigeon Forge Cabin has virtually endless assortment of entertainment options. Another highlight is our 22 seat movie theater where you can watch the latest blockbusters on the big screen. We also have an exciting game room with an arcade so you can challenge your family to your favorite games. Because this wasn’t enough, we included a private heated indoor swimming pool just 150 feet away from the main cabin. Your entire family will love our comfortable sleeping arrangements that are spread throughout our massive cabin! Due to the size, even the largest families will be delightfully surprised of the comfort. 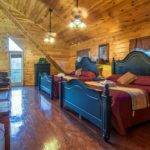 With 9 large bedrooms and 8.5 baths, everyone can enjoy the privacy and comfort that you just can’t find in other cabins. 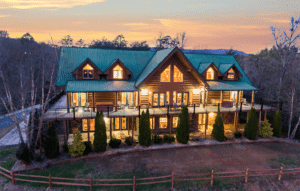 With over 11,000 square foot of indoor space, we are the largest Pigeon Forge cabin in east Tennessee. 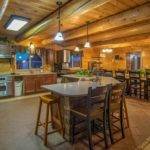 Check out our large Pigeon Forge cabin today to make your plans for your holiday family reunion in the Smoky Mountains! We look forward to seeing you soon at the Moose Hollow Lodge! Had an amazing weekend at Moose Hollow! The house is beautiful and well kept, the amenities are top notch, and there’s so much to do that you never have to leave the house and will still have fun. Between the pool, hot tubs, arcade games, movie room and more, there is enough to entertain and age group.